The Pyramid of Djoser (or Zoser), or step pyramid (kbhw-ntrw in Egyptian) is an archeological remain in the Saqqara necropolis, Egypt, northwest of the city of Memphis. 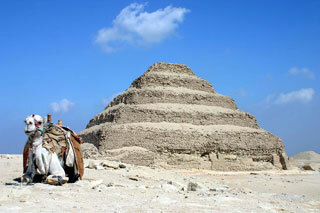 It was built during the 27th century BC for the burial of Pharaoh Djoser by Imhotep, his vizier. It is the central feature of a vast mortuary complex in an enormous courtyard surrounded by ceremonial structures and decoration. This article uses material from the Wikipedia article "Step Pyramid of Djoser", which is released under the Creative Commons Attribution-Share-Alike 3.0 License.